A new Pokémon pattern that will warm your heart. 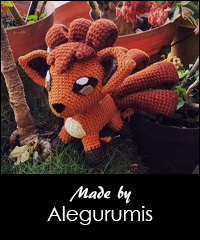 Your team wouldn’t be complete without Vulpix. 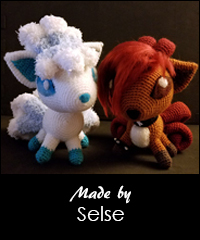 With its strong fire-type moves it can defeat a lot of enemies, but thanks to its pretty tails Vulpix is also used many times in beauty contests. The amigurumi will be about 15 cm tall. This is amazing!! Added to my long list of wants. How amazingly cute!! This is one of my daughters favorites. It’s definitely going on my to do list. Keep up the wonderful designs!! Oh WOW!!! Thank you so much!! What a wonderful Christmas Eve surprise!! Thanks again Sabrina. My daughters birthday is in just a couple weeks and she is going to love this!! Vraiment super réussi ! Bravo ?? I love all your patterns!! Awesome! I’ve never seen this Pokemon character before. He’s very pretty. I love the way you have made his splendidly curled mane and tail.